When NASA's LCROSS lunar probe slams into the moon nextmonth as planned to look for signs of water, it will aim for the south polarcrater Cabeus A, the agency announced today. The $79 million moon-impacting spacecraft is carrying anempty Centaur rocket stage, which has about the same mass as a sports utilityvehicle and will be hurledinto the lunar surface on Oct. 9. Professional astronomers and backyard skywatchers will bewatching the spectacle. 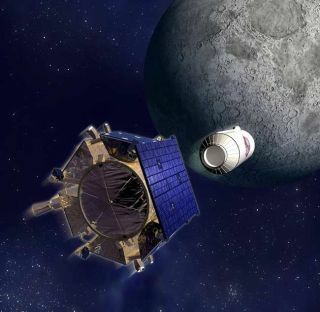 "The purpose of our missions is to see if there mayindeed be somewater ice located in some permanently shaded crater positions on the southpole of the moon," said LCROSS project manager Daniel Andrews. Othermissions have provided tantalizing but so-far inconclusive evidence for waterice there. At the announcement of the crater target, the LCROSS teamdedicated the mission to the late journalist Walter Cronkite. "It's a great honor, thank you very much. Dad would bepleased to be part of this ongoing process," his son, Chip Cronkite, saidat a NASA press briefing. LCROSS will first release its Centaur stage rocket to impactthe crater, then LCROSS itself will impact the lunar surface at about 5,580 mph(8,980 kph), and the resulting ejecta can be examined for signatures of water. "It will kick up whatever is on the floor of thecrater; that may very well include water ice," Andrews said. More than a decade ago, the Lunar Prospector missiondetected hydrogen deposits around the moon's south polar region, suggestingthat some form of water ice may exist where the sun never shines. Finding water on the moon would be a boon for future mannedmissions because it would eliminate the need to haul it up from Earth. The icecould be melted for drinking water, and hydrogen could be extracted for fuel. Cabeus A was one of several finalist craters ? includingShackleton, Shoemaker and Hayworth craters ? examined by the team for manymonths. The crater sits at 81 degrees south on the moon and is relatively large(about 40 kilometers across). The crater also meets other criteria to achieve a successfulimpact that throws up ejecta in a way that telescopes will be able to see it:"We want to hit a nice flat, fluffy place," said LCROSS principalinvestigator Anthony Colaprete. Cabeus A seems to fit the bill, with plenty of flat areasfor the spacecraft to smash into. Data from LCROSS's sister craft, the LunarReconnaissance Orbiter, and the Lunar Prospector show a spot along the rimof the crater that seems to have a relatively high concentration of hydrogen,and so potentially, water. "That is where we think the sweet spot exists," Colapretesaid. The impact will be observed by LRO, the newly refurbishedHubble Telescope, a few other space-based telescopes, and several ground-basedobservatories. "This is very observable from earth," Colapretesaid. "So we'll have lots of eyes on it." NASA will even be soliciting amateur observations, said JenniferHeldmann, lead for the LCROSS observation campaign. LCROSS was launched in June along with LRO, which will mapthe lunar surface in unprecedented detail. The team reported that the spacecraft is in good health, despitea malfunction that caused the craft to burn through half of its propellanta few weeks ago, and everything looks good for impact. "At this point, 28 days out, we have every expectationof finishing the mission with full success," Andrews said.